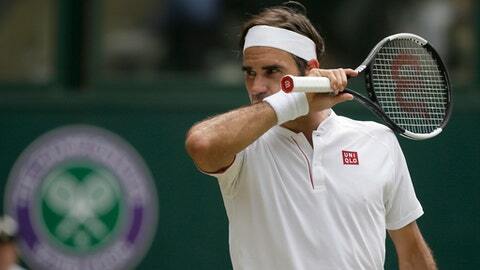 LONDON (AP) Roger Federer was a point away from a rather tidy, straight-set victory in the Wimbledon quarterfinals. One lousy point. And then, slowly, over the next two-plus hours, all the way until the fifth set reached its 24th game, as the temperature dropped and the spectators’ cries of ”Let’s go, Roger!” echoed through the shadows, everything came apart for the eight-time champion against an opponent who’d never beaten him before nor made it this far at the All England Club. In a stunning turnaround in an unfamiliar setting – No. 1 Court instead of Centre Court – the top-seeded Federer blew a third-set match point and, eventually, all of his big lead in a 2-6, 6-7 (5), 7-5, 6-4, 13-11 loss to No. 8 Kevin Anderson on Wednesday in a 4-hour, 14-minute tussle. He’s been flashing some anger this fortnight and did so again in the second set, bouncing his racket off the turf after failing to capitalize on three break points at 1-all. That earned a code violation from chair umpire Carlos Ramos. When Nishikori let his own racket fly in the fourth set, he wasn’t chastised, which prompted Djokovic to yell ”double standards” toward Ramos – drawing boos from fans. Soon enough, Djokovic was on his way to the semifinals, where he will meet Rafael Nadal or Juan Martin del Potro.